All our massage training courses are taught by world class massage teachers and experienced massage therapists. 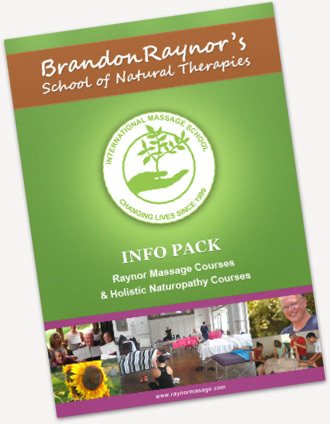 Brandon Raynor has been practicing Massage and Naturopathy for the past 19 years. He is well known and appreciated for his deeply healing massage work and his down to earth teaching style that makes advanced massage techniques and concepts easy for his students to understand. Many people who have suffered serious health complaints, and have tried many other different therapies to no avail, have been able to enjoy a new state of health and wellness by Brandon’s transformative massage techniques. Many of the graduates of Brandon’s massage school have continued on to become among their country’s leading and most reputable massage therapists. Terry Masson has had the wonderful opportunity to work directly with Brandon as his personal assistant on The Freedom Ride (www.thefreedomride.org). Together they promoted Raynor Massage and petitioned for greater freedom in the laws for alternative health care practitioners. Those months on the road with Brandon have helped fine tune his skills in massage so that he is now very capable and confident enough to teach this technique anywhere in the world. With a sturdy background in health, fitness, nutrition, wellness and now Raynor massage; Terry brings his skills in Yoga, Qigong and Meditation to his courses to envelop a wholistic approach to healing. His enthusiastic attitude and caring nature quickly bonds his students in a friendly learning environment where he is able to express this knowledge in easily understood ways. Enjoy our massage training with these excellent massage therapy teachers.